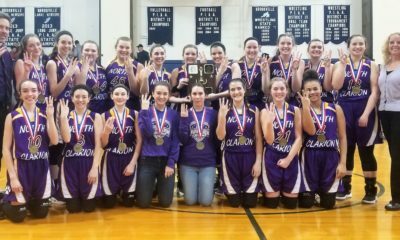 KARNS CITY, Pa. – Brooke Irwin’s layup with 13.3 seconds left lifted A-C Valley to its first-ever KSAC divisional crown with a 54-53 win at Karns City that clinched the KSAC South for the Lady Falcons. Down one with 24.7 seconds left after Emily Hegedus had given Karns City a 53-52 lead with just over 30 seconds to play, A-C Valley got the ball inbounds to Cami McNany, who looked for Ellie Thompson in the paint. But Hegedus had Thompson blanketed, so McNany passed to Kylee Eaton at the top of the key. Eaton then found a cutting Irwin, who beat Livia Andreassi to the low block, and Irwin laid it in for the lead. Following a timeout, Karns City had a chance to win the game, but an Andreassi 3-pointer rimmed in and out, and Alyssa Stitt’s putback attempt was blocked by her own teammate. A-C Valley, which had lost in overtime to Karns City at home in early January, trailed by 14, 40-26, with 4:21 left in the third quarter before going on a 21-0 run that saw Thompson scored nine of her team-high 24 points during the stretch and Emma Fox added five more. The run gave the Lady Falcons a 47-40 lead with 5:25 to go, and the lead was still six, 51-45, following an Eaton bucket with 2:41 left. 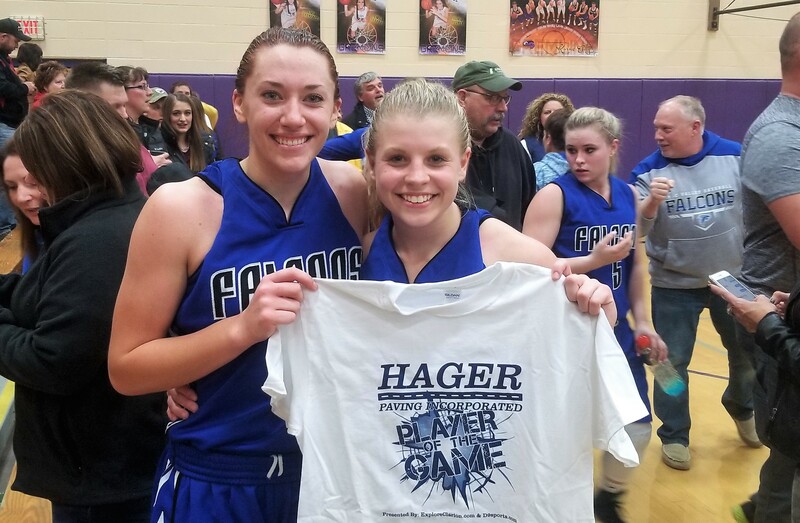 But Hegedus, who scored a game-high 26 points, scored six straight points for Karns City following two Alyssa Stitt free throws to spearhead an 8-1 run that gave the Lady Gremlins the 53-52 lead. Enter Irwin, who up to that point had been more responsible for making Hegedus earn her 26 points than for her offense – she finished with four points. Irwin and Thompson, who added seven rebounds, two steals and an assist, talked about the winning play, the KSAC South championship and more. 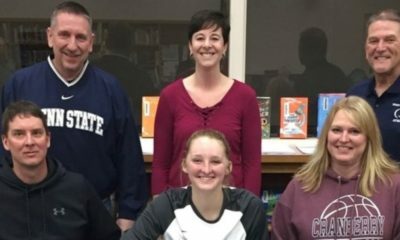 Cami McNany had an all-around strong game for A-C Valley as well with eight points, seven assists, five steals and three rebounds, while Eaton added six rebounds, three points and the game-winning assist. Hegedus added seven rebounds, four steals and a helper to her 26 points for Karns City. Andreassi had 10 points, two rebounds and two assists with Sara Knox adding six points and six rebounds. A-C Valley will play North Clarion at 7:30 p.m. Friday in the KSAC Title Game at Clarion University’s Tippin Gym. STRATTANVILLE, Pa. – Malliah Schreck exploded for 32 points, 11 rebounds, seven steals and four assists to lead visiting Cranberry to a 62-25 KSAC North win over Clarion-Limestone. Hannah Duncan chipped in 10 points, eight rebounds and four helpers for the Berries with Ava Ferringer contributing eight points. Morgan Clark had 13 points to lead C-L.
RIMERSBURG, Pa. – Taylor Geer and Makenzie Byerley combined for 27 points, as Keystone won for the sixth time in nine games thanks to a 63-31 KSAC South road victory over Union. Geer led the Lady Panthers with 14 points with Byerley adding 13. Tessa Weaver chipped in 11 tallies and Kenzie Hovis eight. Frankee Remmick and Hannah Atzeni each scored nine for Union. NEW BETHLEHEM, Pa. – Behind Kristin Auvil’s career-high 27 points Moniteau picked up a 71-59 road KSAC South win over Redbank Valley. Emma Bair added 21 points and 11 rebounds for the Lady Warriors with Andi Arblaster chipping in 14. Lexi Holt exploded for a career-best 35 points while hitting seven 3-pointers for Redbank Valley. In the process she tied the school record for career threes in a game according to head coach Chris Edmonds. Kelsie Elmer added nine tallies and Tara Hinderliter eight. MARIENVILLE, Pa. – Wendy Beveridge and Kait Constantino combined for 46 points in a 56-33 Clarion road win over Forest Area at East Forest in KSAC North action. Beveridge had a game-high 25 points with Constantino adding 21. Sadie Rudesyle chipped in six points and 12 rebounds. Bianca Hetrick’s 15 points led Forest Area. TIDIOUTE, Pa. – Tori Obenrader netted 25 points and hauled down six rebounds, as visiting North Clarion cruised to a 65-27 win over Tidioute Charter. Abby Gatesman and Gabby Carll both added 11 points apiece for the She-Wolves with Ciearah Manross chipping in eight. Nakiesa Krouse had a team-best 10 points for the Lady Bulldogs. DUBOIS, Pa. – Leah Miller’s 18 points, 17 rebounds and five blocked shots lifted helped visiting Punxsutawney cruise past DuBois Central Catholic, 41-14. Kate Horner added 16 points, four steals, three assists and three rebounds for the Lady Chucks with Sarah Weaver scoring three points, swiping five balls, blocking two shots, handing out two assists and hauling in two rebounds. Shay Gulvas had eight points for DCC. 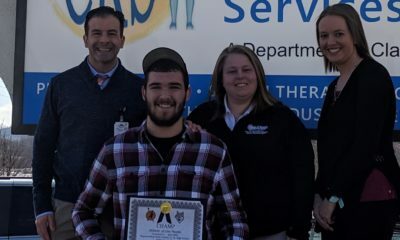 BRADFORD, Pa. – Visiting Brookville broke open a close game at halftime but outscoring host Bradford 33-17 in the second half for a 61-42 D9 League win. The Lady Raiders put three players in double-figure scoring, led by the Johnson sisters of Morgan and Madison who scored 15 and 14 points respectively. Marcy Schindler had 13 points. Erica Marshall and Hannah Lary scored 19 and 11 points respectively for Bradford. CURWENSVILLE, Pa. – Madi Weber’s career-high 35 points lifted Curwensville to a 66-31 AML victory over visiting Sheffield. Brianna Swindell added 15 points for the Lady Tide with Sabrina Spencer chipping in eight. Mya Grubbs led Sheffield with nine points with Eliza Davidson and Lexi Lyon each scoring eight. BROCKWAY, Pa. – Emily Fullem’s 13th straight double-double lifted visiting Ridgway to a 43-23 AML victory over Brockway. Fullem had 16 points, 18 rebounds, six blocked shots, three steals and two assists for the Lady Elkers. Casey Woodford added eight points and six rebounds with Carlee LeBenne chipping in seven points and six boards and Alyssa Kasmierski seven points and four assists. Morgan Lindemuth had eight points to pace Brockway. PHILIPSBURG, Pa. – Hailey Herrington exploded for 44 points to lift Philipsburg-Osceola to a 70-62 win over visiting Clearfield in Mountain League action. Alayna Ryan had 23 points. 10 assists and six rebounds to pace Clearfield with Megan Durandetta adding 18 points while nailing five 3-pointers. Brooke Cline chipped in with 13 points. KANE, Pa. – Ella Marconi and Trinity Clark both had double-doubles to lift Kane to a 54-34 win over visiting Johnsonburg to complete a perfect 10-0 AML campaign for the Lady Wolves. 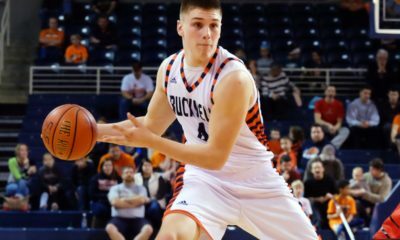 Marconi had a game-high 17 points to go with 11 rebounds and eight blocked shots, while Clark added 11 points, 10 rebounds, six blocks, five assists and five steals. Hannah Buhl also scored 11 points to go with six helpers, and Rachael Morgan had 11 tallies and seven boards. Rylee Casilio paced Johnsonburg with 13 points with Maria Jones adding 10 and Cassidy King nine. ULYSSES, Pa. – Becca Morgan’s 11 points led a balanced Northern Potter effort in a 41-26 North Tier League win over visiting Galeton. Kalie Cowburn added nine points for the Lady Panthers with Mikayla Lewis scoring eight and Abbi Anderson seven. Makaya Shadle had 11 points for Galeton. Feb. 10, 2018 District 9 Basketball Schedule Powered by CBF Contracting, Inc.